Alopecia mucinosa, often referred to as follicular mucinosis, was first reported by Pinkus in 1957. The dermatologic eruptions consist of follicular papules and/or indurated plaques that demonstrate distinct histologic changes in the hair follicles that lead to hair loss. The accumulation of mucinous material in the damaged hair follicles and sebaceous glands creates an inflammatory condition and subsequent degenerative process. The face, the neck, and the scalp are the most frequently affected sites, although lesions may appear on any part of the body. Alopecia mucinosa is a disease process defined histopathologically by mucin deposition in hair follicles and sebaceous glands, which undergo epithelial reticular degeneration. The exact pathogenesis is unknown, although the role of circulating immune complexes and cell-mediated immunity has been considered. The 3 clinical variants of the disease consist of a primary acute disorder of young persons, a primary chronic disorder of older persons, and a secondary disorder associated with benign or malignant disease. Courtesy of Dirk M. Elston, MD. Primary chronic alopecia mucinosa of older persons affects people older than 40 years. Lesions have a widespread distribution, and they may persist or recur indefinitely. No associated disorders are identified. In most patients who exhibit both alopecia mucinosa and mycosis fungoides, these conditions appear to develop concomitantly; however, the concern exists that individuals exhibiting only alopecia mucinosa may also be at risk for subsequent development of lymphoma. Alopecia mucinosa is a rare condition. The precise data on its frequency are not available. Primary generalized disease affects people older than 40 years. Secondary disease with either a benign or a malignant association usually affects people in the fifth through eighth decades of life. Primary acute disease usually disappears within 2 years; however, childhood alopecia mucinosa is not always self-limited and may possibly be related to Hodgkin disease. Primary chronic disease usually lingers for several years, but it can fluctuate in the extent of skin involvement at any given time. Secondary alopecia mucinosa has the least favorable prognosis when associated with coexistent malignancy. Mortality is related to the coexistence of mycosis fungoides in secondary alopecia mucinosa. An estimated 15-40% of adults with alopecia mucinosa will eventually develop lymphoma, if they do not already have it. The malignant potential of alopecia mucinosa cannot be fully assessed because of the enigmatic nature of this and other cutaneous T-cell abnormalities. The morbidity of primary alopecia mucinosa is generally restricted to cosmesis; whereas, in cases of secondary alopecia mucinosa, morbidity is related to the associated disease process. Pinkus H. Centennial Paper. Alopecia mucinosa. 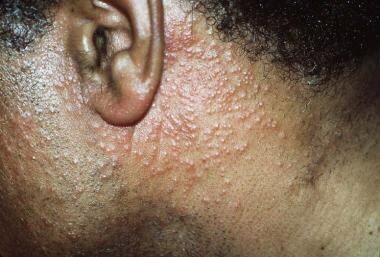 Inflammatory plaques with alopecia characterized by root-sheath mucinosis. By Hermann Pinkus, M.D., Arch Dermatol 1957. Arch Dermatol. 1983 Aug. 119(8):690-7. [Medline]. Dalle S, Marrou K, Balme B, Thomas L. Neonatal follicular mucinosis. Br J Dermatol. 2007 Sep. 157(3):609-10. [Medline]. Buchner SA, Meier M, Rufli T. Follicular mucinosis associated with mycosis fungoides. Dermatologica. 1991. 183(1):66-7. [Medline]. Clark-Loeser L, Latkowski JA. Follicular mucinosis associated with mycosis fungoides. Dermatol Online J. 2004 Nov 30. 10(3):22. [Medline]. Lacour JP, Castanet J, Perrin C, Ortonne JP. Follicular mycosis fungoides. A clinical and histologic variant of cutaneous T-cell lymphoma: report of two cases. J Am Acad Dermatol. 1993 Aug. 29(2 Pt 2):330-4. [Medline]. Bi MY, Curry JL, Christiano AM, Hordinsky MK, Norris DA, Price VH, et al. The spectrum of hair loss in patients with mycosis fungoides and Sézary syndrome. J Am Acad Dermatol. 2011 Jan. 64(1):53-63. [Medline]. Dalle S, Balme B, Berger F, Hayette S, Thomas L. Mycosis fungoides-associated follicular mucinosis under adalimumab. Br J Dermatol. 2005 Jul. 153(1):207-8. [Medline]. Scheinfeld N. Imatinib mesylate and dermatology part 2: a review of the cutaneous side effects of imatinib mesylate. J Drugs Dermatol. 2006 Mar. 5(3):228-31. [Medline]. Roth DE, Owen LG, Hodge SJ, Callen JP. Follicular mucinosis associated with pregnancy. Int J Dermatol. 1992 Jun. 31(6):441-2. [Medline]. Lockshin BN, Khachemoune A, Cohen C. Follicular mucinosis in a 4-year-old boy. Int J Dermatol. 2004 Dec. 43(12):950-2. [Medline]. Nickoloff BJ, Wood C. Benign idiopathic versus mycosis fungoides-associated follicular mucinosis. Pediatr Dermatol. 1985 Mar. 2(3):201-6. [Medline]. Gibson LE, Muller SA, Leiferman KM, Peters MS. Follicular mucinosis: clinical and histopathologic study. J Am Acad Dermatol. 1989 Mar. 20(3):441-6. [Medline]. Fernandez-Guarino M, Harto Castano A, Carrillo R, Jaen P. Primary follicular mucinosis: excellent response to treatment with photodynamic therapy. J Eur Acad Dermatol Venereol. 2008 Mar. 22(3):393-4. [Medline]. Meissner K, Weyer U, Kowalzick L, Altenhoff J. Successful treatment of primary progressive follicular mucinosis with interferons. J Am Acad Dermatol. 1991 May. 24(5 Pt 2):848-50. [Medline]. Courtesy of San Antonio Uniformed Services Health Education Consortium (SAUSHEC) teaching files.